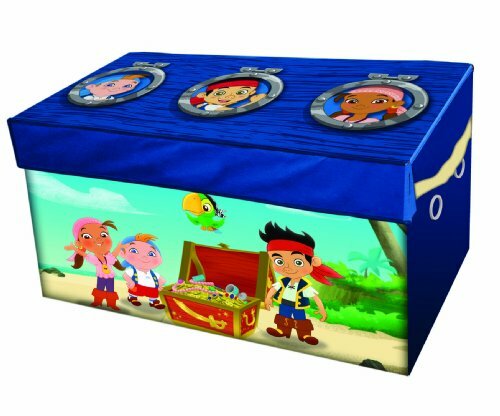 The Disney Jake and the Neverland Pirates Collapsible Storage Trunk makes a perfect addition to your child’s bedroom, closet, or playroom. The storage trunk is an easy way to maintain clutter while adding a playful accent. Your little one will love to put away all their toys, books, clothing, and more in this spacious storage trunk featuring his or her favorite character. It's made of a soft canvas material, so you never have to worry about the lid slamming down. Collapsible and lightweight, our storage chests are perfect for storing just about anything. When not in use, it can fold down flat and be tucked away. Storage trunks are also available in other Nickelodeon and Disney characters such as Doc McStuffins, Spongebob Squarepants, and Teenage Mutant Ninja Turtles. It is not meant for sitting or standing. Do not give to children under 3 years of age due to loose parts.